Yesterday, I spent a very interesting morning at the University of Bath with Professor Michael Danson. I attended my first Enzyme Kinetics lecture for over twenty years. I went to observe Michael’s lecture because he doesn’t use slides for his lectures. Rather he uses the white board and derives enzyme kinetics equations with the students. Michael was very generous with his time and we discussed the development and value of his teaching style. Michael said that his teaching style was developed to communicate insight, understanding and enthusiasm. Because he doesn’t have lecture slides, he can’t share them with his students. If the students want to learn they have to take some notes! The interactive style suggests a high level of commitment to the students and the learning experience. It paces the material at a speed that the students can take notes. The students take notes, in part, because there are no slides. The engagement of the students was obvious to me as the observer. They were all busy transcribing the equations. Using multiple senses improves learning. It allows the material to be adjusted during the course of the lecture with minimum disturbance. Students can ask questions, seek clarification and comment on the material. The lecturer can respond more easily that if she had a fully planned slide driven lecture. In contrast, a completely planned slide based lecture can constrain and even prevent student interaction. All the lecture content can be displayed at one time. By using multiple boards, links can be made between different aspects of the lesson. 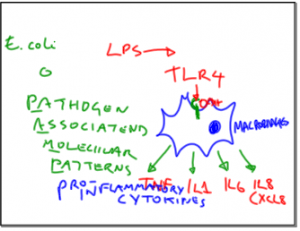 I use a low tech approach, using markers and a flip chart, to review immunology. I do this to improve student interaction and to prevent them falling asleep. It allows me to modify my lecture on the fly. I require responses from the students. I expect them to contribute to the lecture – answer questions, explore concepts, identify gaps in their knowledge. I have used this successfully with small groups – up to 20 students but I have never tried it with larger numbers. Michael gave a lecture to 100 students today. Another advantage of my approach is that I am not tempted to spend hours fiddling with my slides. I still have to prepare of course but I prepare in a different way. I re-read the textbook or a review. I do a brief literature search for new inspiration. I think about what I am actually going to say. Typically this takes less time than it does to update slides and print them out. This is not a reason to adopt a more interactive style but it’s an advantage for me. In summary, I believe that a low tech approach to delivering lectures can be a useful technique to aid student learning and promote engagement with material. I think it should be considered as a valuable tool for any University lecturer.